Package contains new textures 17-20 from Shadertoy and a cubemap from Humus (used by "Crystal Skull"). Copy missing textures from code sample pack or MadShaders' data folder. Demos tagged WIP don't work properly for misc. reasons. Highlights are some [SIG15] submissions and most excellent shader "Snail". 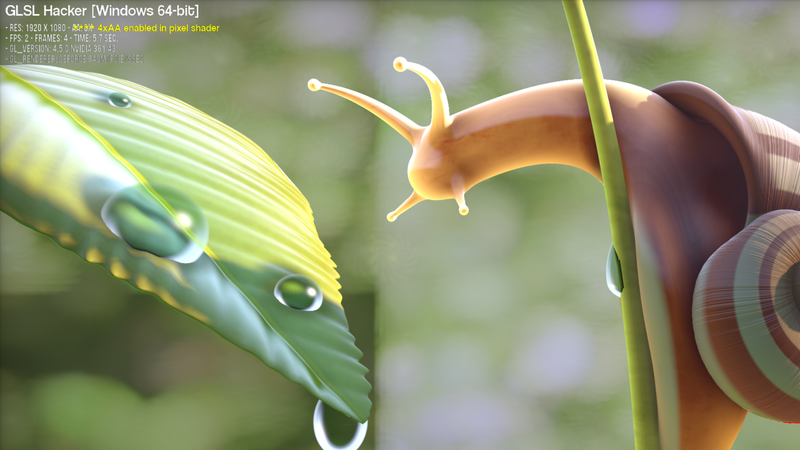 Note: the background in "Snail" is messed up in GeeXLab for some reason. In some other shaders before (e.g. "River Styx") i noticed that GeeXLab dislikes code lines with colons and questionmarks. 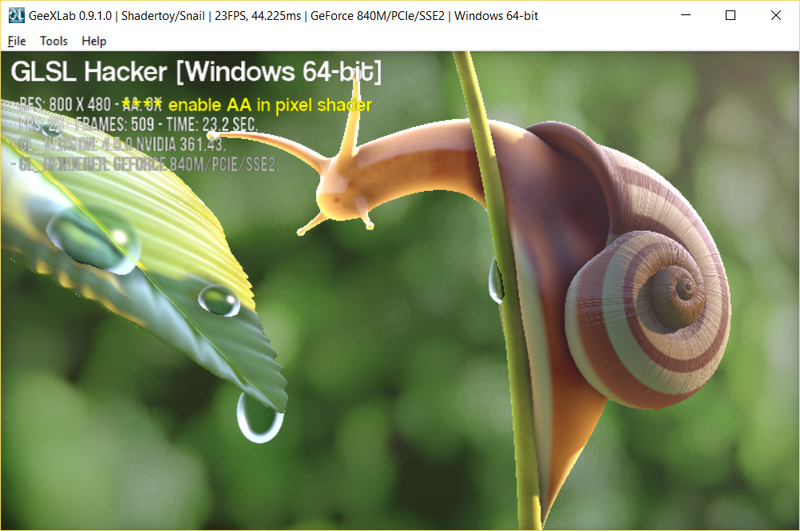 "Snail" sample, "ShaderToy" online is 7x faster than GeekLab or GLSLHacker!?!! Why?? Because of bad code for GeekLab or GLSLHacker? 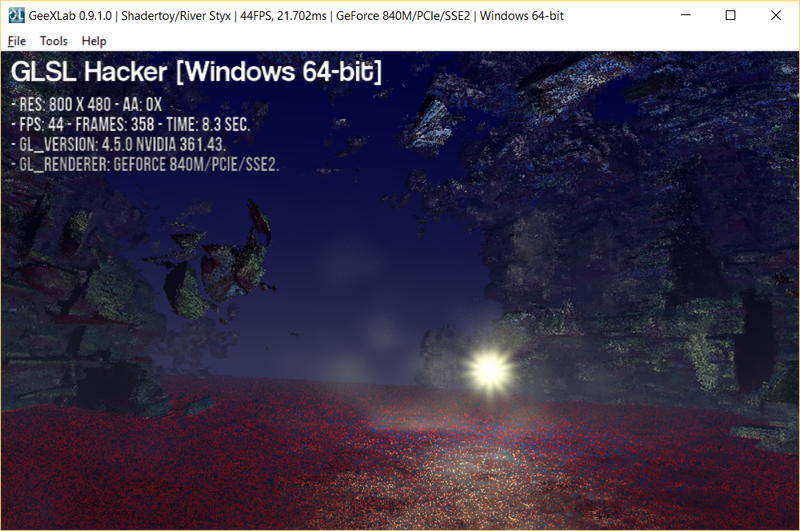 GeekLab or GLSLHacker: 4 fps at max windowed in 1024x768 desktop. As you can read in overlay, i activated 4xAA in pixel shader. 1xAA or 0xAA: 65 fps - woww!?!! At max windowed in desktop 1024x768. Usually this is redundant, but in this case it showed the backbuffer. Also i made the overlays more clearly. Works fine now on AMD and NVIDIA, fails to render on Intel. Pixel shader error: C0000: syntax error, unexpected '=', expecting ',' or ';' at token "="
(mapDE(rO + halfwayT*rD) < 0.) ? t.x = halfwayT:t.y = halfwayT;has been fixed by replacing questionmark and colon with commas. I have no idea why the original code compiles at shadertoy.com, but fails in GeeXLab.